Leeds United are widening their search for a new centre-back as they wait to see if Sol Bamba will take up the offer of a return to Elland Road. United have begun assessing alternatives to Bamba amid on-going discussions about a deal which brings the Ivory Coast international back to Elland Road this summer. Leeds have an agreement in place with Bamba’s existing club, Palermo, and their interest in him has not been affected by his cutting assessment of Massimo Cellino’s management of the club last month. Speaking after the final game of the 2015-16 season, Bamba made clear his desire to take up a permanent contract at Elland Road but he criticised the treatment of former head coach Neil Redfearn and assistant Steve Thompson and described the running of Leeds as “ridiculous”. Cellino, nonetheless, has been in touch with Bamba’s agent since returning from his Football League disqualification and Bamba is the club’s preferred choice in an area which the club intends to strengthen. The two sides are yet to agree on a wage package, however, and the situation is likely to come to a head shortly with United’s deal with Palermo due to expire later this month. 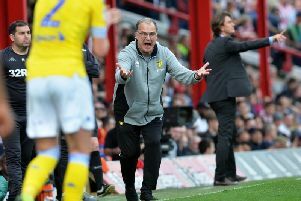 Leeds negotiated an option to take Bamba full-time when they signed him on a half-season loan in the January transfer window. The 30-year-old defender has two years left on his Palermo contract but he has made only one league appearance for the Italian club and does not appear to be part of their plans. Bamba admitted shortly after joining Leeds that he did not expect to stay with Palermo this summer, saying he was confused by his peripheral role there. “If I’m honest I don’t think (he’ll remain at Palermo),” Bamba said. “Not unless the manager changes. The club made it clear that they want me to come back and play but I don’t see that happening. Sources on the continent claim that Bamba’s agent has been in touch with Middlesbrough about a possible move to The Riverside but Leeds have not ruled out the possibility of striking a deal. The club, however, have been casting their eye over the market with the aim of finding options if talks with Bamba fail. United approached Alex Pearce, the Reading captain who is out of contract and is leaving the Madejski Stadium, but Pearce is understood to be reluctant to move to Yorkshire. West Bromwich Albion’s Chris Baird – another out-of-contract player – has also been linked with Leeds. The agent of Matt Mills, another rumoured target, told the YEP yesterday that there was “nothing in the talk” of Mills moving to Elland Road. United are yet to finalise their first deal of the summer but the club are confident that Motherwell striker Lee Erwin will accept a three-year deal at Elland Road on his return from a holiday in America. Cellino, who was due to leave England for Italy on business yesterday, has been in contact with Erwin’s representatives for most of the past week and appears optimistic about landing the 21-year-old’s signature. Erwin’s deal at Motherwell ends on June 30 but he will command a six-figure fee due to his age. The Fir Park club have offered him an extension to his existing contract but reports in Scotland say Erwin informed Motherwell over the weekend that he would be leaving. The forward, meanwhile, appears to have avoided the threat of him starting next season with a suspension. Erwin was believed to have been sent off at the end of Motherwell’s Scottish Premiership play-off victory over Rangers on Sunday following an ugly confrontation with Rangers defender Bilel Mohsni. Motherwell confirmed yesterday that Erwin had received only a yellow card.